Home Technology StarCraft + Comcast = Success! I’ve been banging my head on the desk for 4 days now to try to figure out why I can’t install StarCraft II on my computer. Part of the initial problem is that my CD is scratched so I had to revert to downloading it from the internet. I downloaded the StarCraft II: Wings of Liberty – PC from Blizzard and ran it. After a few minutes I received a warning similar to the one above. 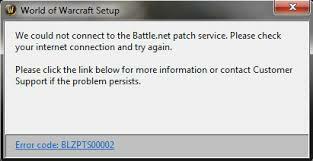 I followed the instructions on https://us.battle.net/support/en/article/failed-to-connect-to-the-battlenet-patch-service but it didn’t seem to work. The anti-virus was disabled. Startup programs were disabled. Turned off pretty much everything and received the same error message. Troubleshooting this started to get frustrating. Being the excellent troubleshooter that I am, I decided to take a look at the router. The firewall settings were set to high. I was having problems using SSH to get to my other servers but that’s another similar story. After changing the settings to low I started up the installer and instantly StarCraft started to download. I didn’t see this solution out on the interwebs so I decided to share. 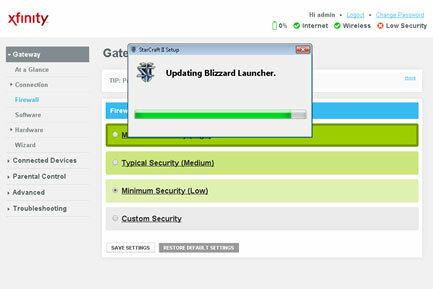 If you see the error message BLZAPPBTS00002, then try out everything they recommend and then check your router settings.